This learner guide is a self-paced resource which will help you gain the knowledge and skills required to effectively work with clients accessing services established within the context of the family law system. These services may include counselling, dispute resolution, children's contact services, and family relationship centres. The target audience for this resource is an individual who plans to work in the community services sector. This learner guide is a self-paced resource which will help you gain the knowledge and skills required by the worker to support clients to voice their opinions or needs and to ensure their rights are upheld. The target audience for this resource is an individual who plans to work in the community services sector. This learner guide is a self-paced resource which will help you gain the knowledge and skills required to provide and maintain support to community groups. The target audience for this resource is an individual who plans to work in the community services sector. 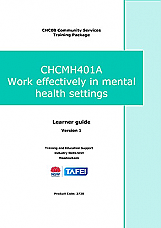 This learner guide is to assist community services workers work in the non-clinical mental health sector and covers the history of mental health approaches in Australia, relevant legislation, key stakeholders and the range of services in the sector, values and philosophy and current approaches including working collaboratively, recovery and the influence of the consumer/client movement. This learner guide is a self-paced resource which will help you gain the knowledge and skills to describe the knowledge and skills required to provide a range of opportunities for community groups and individuals to participate and design cooperative arrangements for addressing common concerns. The target audience for this resource is an individual who plans to work in the community services sector. This learner guide is a self-paced resource which will help you gain the knowledge and skills relevant to the unit of competency. 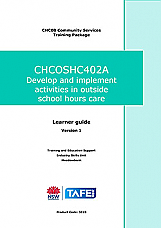 It contains learning activities, some of which reflect workplace activities, as well as other materials aimed to enhance the learning process. This unit describes the knowledge and skills required by community services workers who may have limited contact with clients in terms of content and timing and operate under direct supervision. This learner guide is a self-paced resource which will help you gain the knowledge and skills required to meet the specific needs of a broad range of existing and new clients within a defined framework. 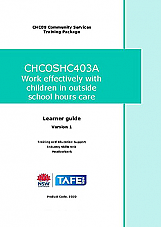 This learner guide for CHCCS211A Prepare for work in the community sector is a self-paced resource which will help you gain the knowledge and skills required by those people who may be undertaking preliminary training to enter the community services industry. This learner guide is a self paced resource to assist you to gain the knowledge and skills relevant to the unit of competency. © 2019 TAFE NSW VETRES.